This blog is dedicated to the little squirrels of this planet and in the entire cosmos. 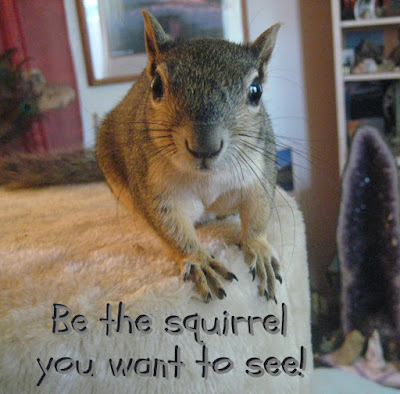 This blog is made with love and gratitude to all my squirrel teachers. Long may their tails wave! When I found Bonzo sitting on my Macbook chewing on the keys, I was absolutely enraged! Mostly because I thought I'd have to replace the whole keyboard which could cost anywhere from $280.~ to $400.~ OMG. So off I went to the Apple Genius Bar at the Barton Creek Mall. I had to leave my computer there for about four days. Thankfully, Bonzo hadn't damaged the piece of the apparatus that would warrant a new keyboard! A very competent tech named David was able to repair all six keys, making my laptop "as good as new"! Not only that, but the cost of repair was $0.00!! After this event, I was being very careful to either close the cover OR at least put some books on the keyboard when I went into another room in the house. However, on Thanksgiving morning, I had to run out to put gas in my car, thinking that many of the stations would close early. I did not close the laptop, but since I had put some books on top of the keyboard, I figured it would be OK. When I came home, the "Bonz" was happily chewing away and had removed the "A", "Z", "option", and "function" keys. After locking Bonzo in his cage, I got online and immediately made an appointment at the Apple store for repair, and then tried to carry on as usual. Poor Bonzo. Come to find out he just really enjoys chewing on plastic items... plastic clips, cinch ties, laptop keys, etc. I guess I should have had faith that Admiral Nut would take care of everything, but I didn't. So on my 2nd trip to Apple, I was pleasantly surprised that the Apple tech that helped me was David, the one who did the first repair! There are literally hundreds of techs... I mean what are the odds?? He took the computer back into the shop while I waited. (I don't know how long it took since I was having a lovely conversation with another squirrel-lover sitting next to me. Awesome.) David finally returned with all the keys fixed except the "A". He said that the piece that makes the contact was gone and that he had to take a piece from another laptop and place it there. He wasn't sure yet whether it would work (make contact). In fact, they didn't have any extra "A"s in the back so he used the one I brought with me. He snapped it on. So far so good. Now we just had to turn it on and try it out to see if it worked! And "VOILA" ! It worked! The A made contact! OMG. That just saved me hundreds of dollars. David said there was no charge for the repair. 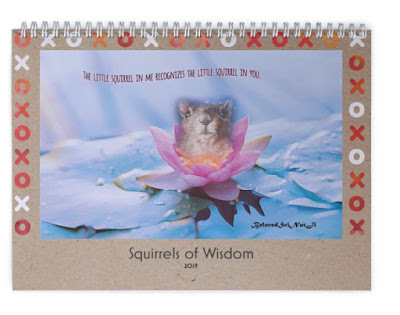 So I told him I would bring him a 2019 Squirrels of Wisdom Calendar and he said that the techs really are not allowed to accept any gifts. When I insisted, he said if it was for everyone to enjoy, then it would be OK.
Well, I never thought there would be another little boy squirrel like my Mr.Nut, but I was wrong. I do believe my sweet Bonzo has much in common with Mr.Nut. You see, both boys had a rough start in this world. Bonzo was having a normal life with his mom and siblings until one day, mama disappeared (probably due to a predator). Then the next day, his siblings disappeared as well, and he was all alone to fend for himself. Bonzo was alone for 24 hrs before he was found. Similarly, Mr.Nut and his brothers were content in their tree until someone knocked their nest down. Long story short, the nest was found by a woman, but only 2 of the 3 squirrels were in it. Then, 24 hours later, Mr.Nut was found all by himself. You see, both Bonzo and Mr.Nut were all alone to fend for themselves a full day before someone found them. This period of time without any mother or siblings to keep them warm had an effect on their development. At least Bonzo was a few weeks older so he was not as seriously affected as was Mr.Nut. Mr.Nut was only 2 weeks old and could not maintain his warmth without another warm-blooded mammal to help him. He was cold when I got him. 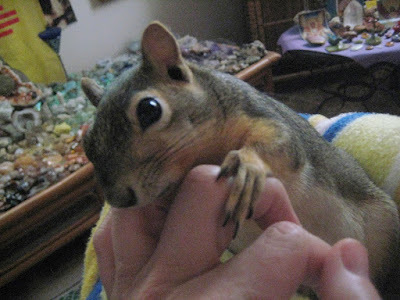 And now, just like Mr.Nut, my Bonzo loves to cling to my hands. He holds on as if to say, "Momma, I will never leave you!" Is Bonzo a reincarnation of Mr.Nut? I really don't know. But I will say that it is wonderful to be reminded of Mr.Nut on a daily basis. 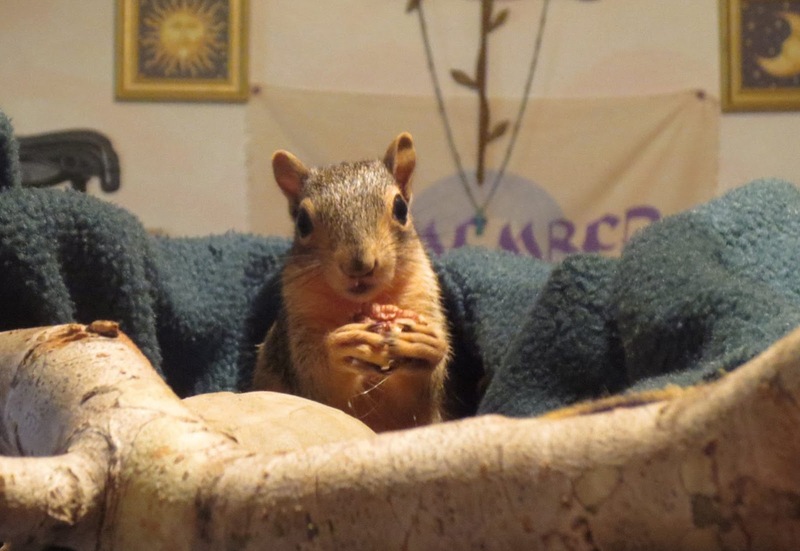 Bonzo is full of juicy happiness and loves to be the "kitchen squirrel". He continues to let me know how much he loves me! And there's nothing better than that! So, it's come to my attention that there is a great deal of confusion over the term "Enlightenment". For thousands of years, the term 'enlightenment' has been equated to 'Self-realization'. And Self-realization has meant the discovery that YOU are not the small self, but rather the Self with a capital S, which is to say... the Totality. I beg to differ in the use of terms. We can and should be more precise in our selection of words!! 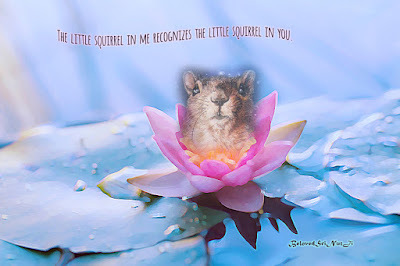 I have come to discover that this "Self" the sages and masters talk about is none other that the Great Squirreluminosity! i.e.... 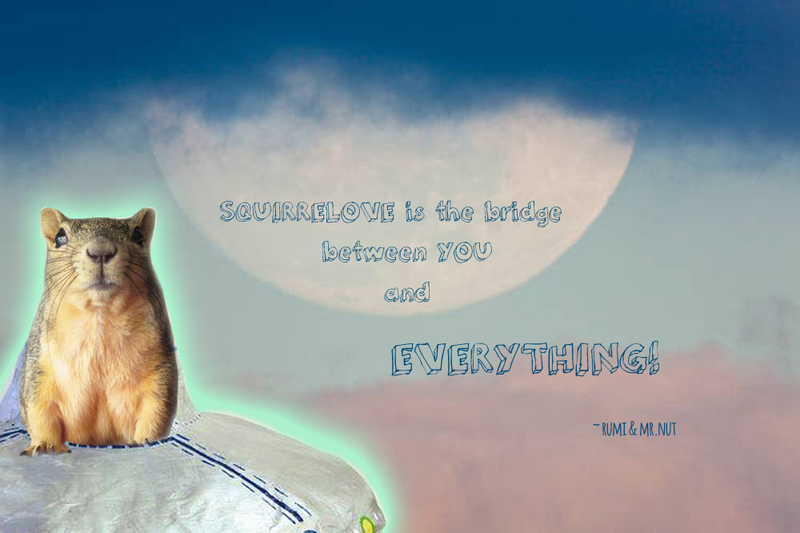 The Squirreluminosity, aka Juicy Squirrel Happiness, aka The One Squirrel Heart.... all point to the same "Self"!!! 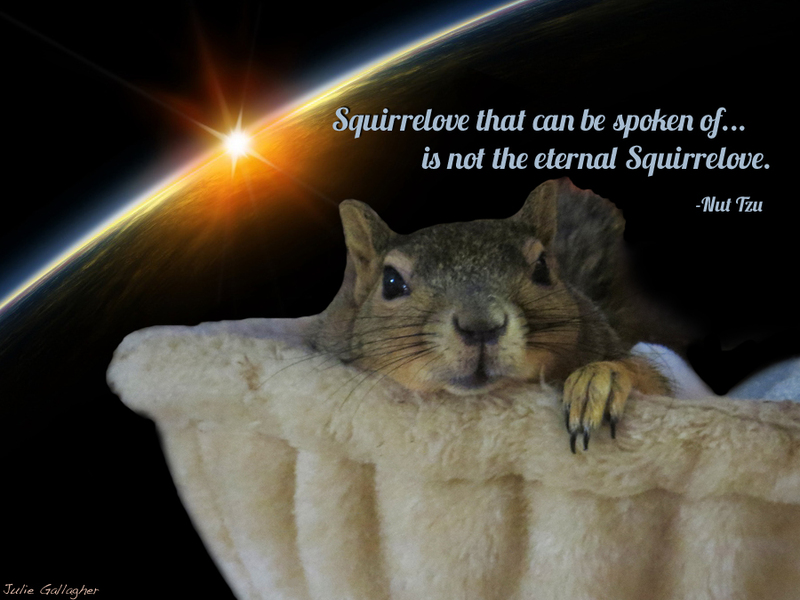 Therefore, What humans are really seeking is none other than Squirrel-Realization! (Squirrel with a capital S) I can attest to the Truth of this, but to give you your own experience, I would recommend that you listen to the song that our Miss Nutleigh gave the world. This song was performed at Byron Katie's New Year's event just a few weeks ago. 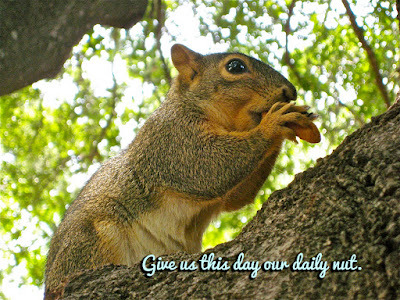 we express our profound gratitude for all the transformation that the little squirrels have facilitated on our planet! Long may their tails wave! Well, it's been a year since I made a post. Since my favorite muse, Commander Nut passed away in early 2016, the flow of writing has practically slowed to a halt. Mr.Nut was always talking to me and giving me great insights and topics to write about. Everything was so easy with him by my side. I sure do miss that buddha. But here's what's happening now... one way to describe it is that Mr.Nut is back again, but that's not entirely accurate. Let's just say "his energy" is back again. Last April, I created a beautiful postage stamp of Mr.Nut because I knew he could help get the mail delivered much faster, being that he's traveling around in a spaceship. 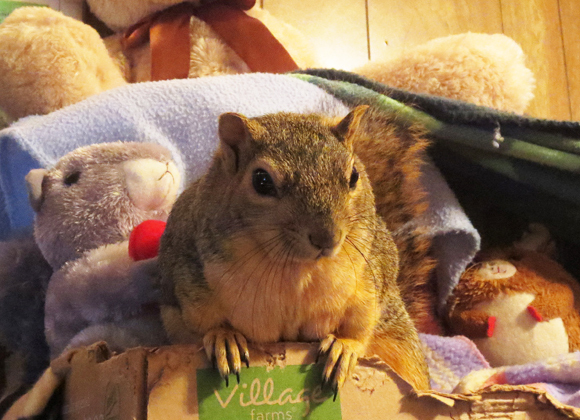 Well, just a couple days later, a mail carrier found an orphaned baby squirrel and brought her to me. Wow... that was the first time I got a squirrel by mail! You can read the story HERE. At the time, I had a feeling that Mr.Nut had sent her to me... time would tell. The little baby squirrel grew into a beautiful young lady-squirrel. The interesting thing is that she acts a lot like Mr.Nut, and more so each day. And then, just in the last few days, she has been talking up a storm. She is here to carry on the mission of the good Admiral. She is a messenger of love and hope for the planet. She said that she prefers to be called "Chippy Nut" as she is part of him. You see, Admiral Nut needed a counterpart here on earth so that he could continue his work here. 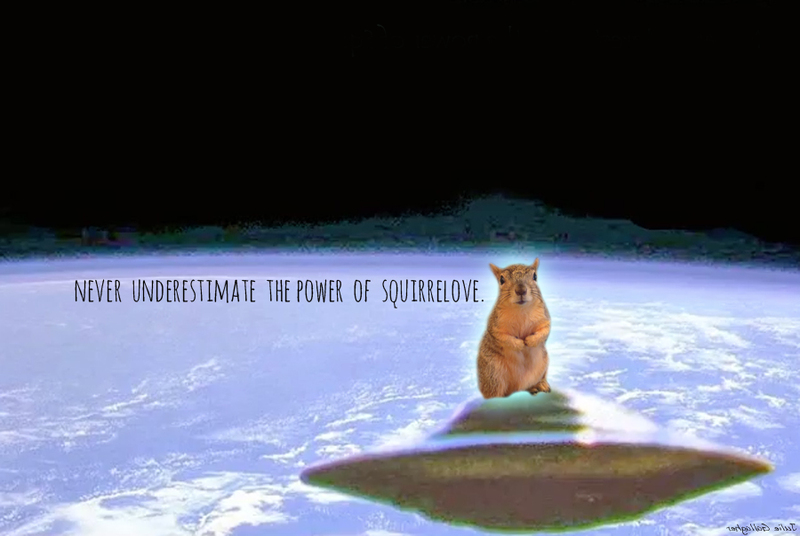 So this morning, Chippy Nut told me that it is important to continue to spread "Squirrelove". And no matter how terrible things can seem "out there", it is absolutely paramount to remain "inside" in the heart-wisdom. She says it is easy to react negatively to negative events. But she urges us to be vigilant... to stay focused on kindness and compassion. She also told me that Admiral Nut's friend, Dr.Stephen Greer of CSETI, has written a new book called "Unacknowledged". It is the real scoop about the extra-terrestrial life that our galactic squirrel family has known about all along. And they are here to help us protect and heal our dear Mother Earth. She urges us not to be "fooled" by the many gloom and doom movies that portray the ET's and UFO's as enemy, for they are our allies and helpers. Like the squirrels, they have gotten a "bad rap". 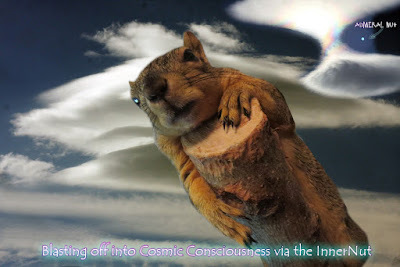 But as squirrel-consciousness has increased dramatically... the earth is now ready to see the Truth of our Galactic Family (of which squirrels are a majority.) Be open to their message! LOVE LOVE LOVE .... is what's REAL. BE the LOVE that you ARE! Yes, the earth is in trouble.... and many people have given up hope. 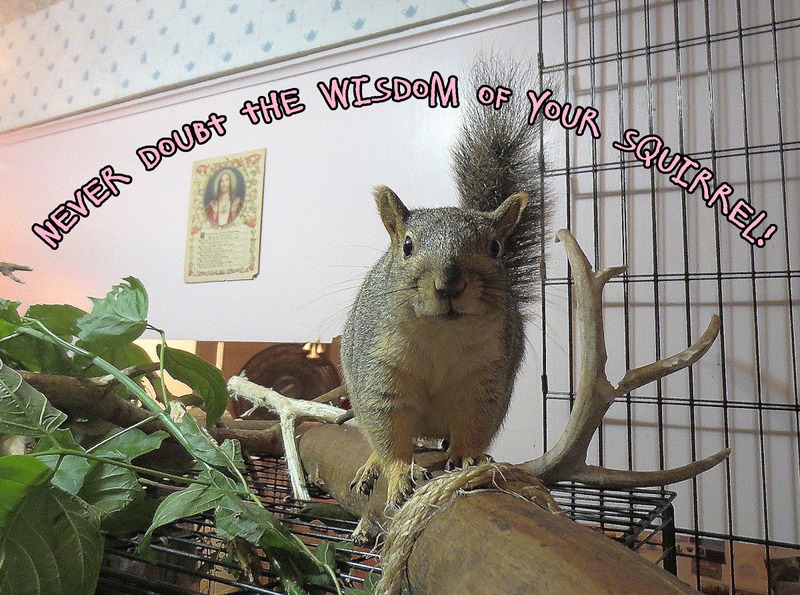 But the squirrels are here to say: "Don't despair!" Pop media might not have the full story, but they do acknowledge squirrel-intelligence. And we've known this all along, however unbelievable it seemed. 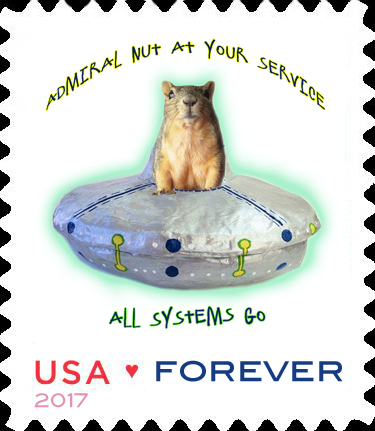 Commander Nut was here to comfort us and now, as Admiral Nut, flying around the ethers, is keeping every little thing balanced. Just because things looks bleak, please don't despair. It's not over until the fat squirrel sings. "I will be with you always, and I will send helpers to get you through the tough times ahead." One never knows what "form" a teacher will take. For me, I've been blessed with a series of squirrel teachers. And through the 13 years of adopting these orphaned baby squirrels, rehabbing them, releasing most to the outdoors, and giving "forever" homes to the non-releasables, I've come to see them as TRUE BUDDHAS. 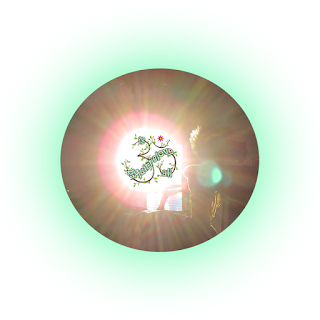 And now, through their eyes, I can see, finally, my own "Buddha Nature". Many times I would sit and stare into the eyes of one of my "rescues" and suddenly there would no longer be a subject and an object. Rather, there was only the dissolving into PURE LOVE... falling into the One Heart only to find out THAT'S ALL THERE IS! And "I" AM THAT! One of the great things about squirrels is that they're not concerned with following some "leader". 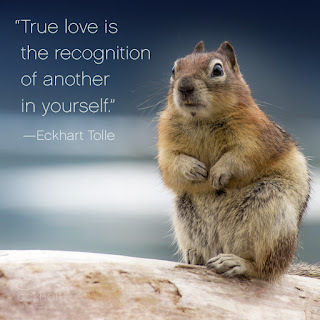 They don't require a "squirrel in charge" because they all tune inside to the "One Squirrel Heart"... which is one undivided whole. In fact, this is the very same "Heart" that resides in each of us; what some nondual teachers refer to as "The Absolute". In the beginning, when I took in a motherless baby squirrel, I thought that I was helping her... but in time, I discovered that it was actually the other way 'round. That baby was Grace coming into my life to shower me with my own goodness! Wow-- What a gift! 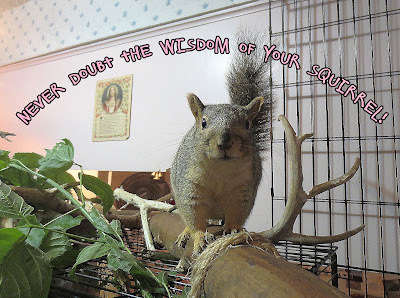 Most recently, I was sitting with one of my new squirrels, Miss Nutleigh. At one point, I caught her gaze and a song of wisdom came through me from her and I recorded it. Much later, in listening to myself singing it again, I heard the words on another level. 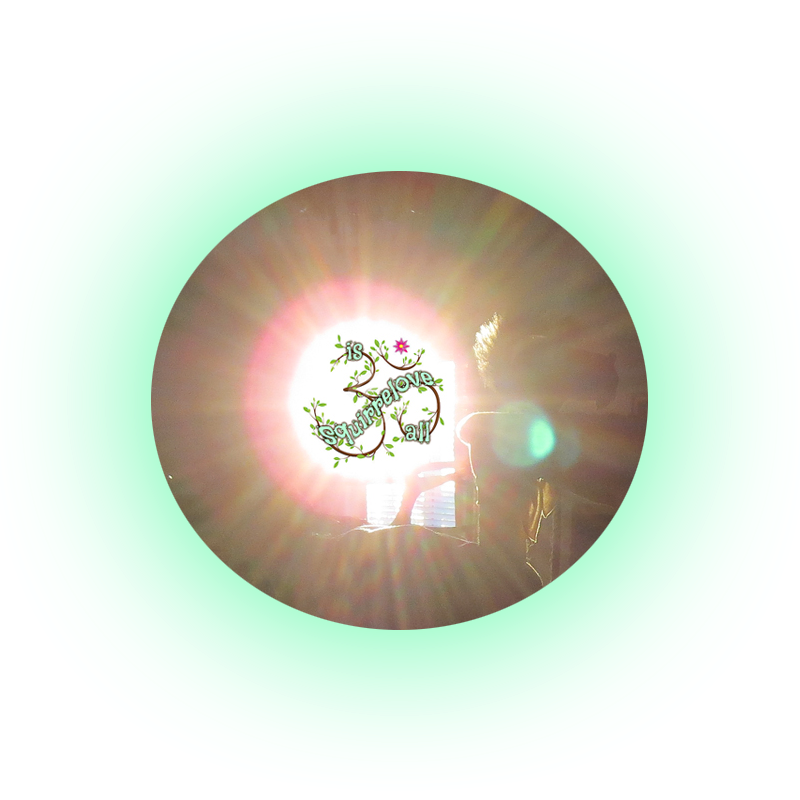 I realized in that moment that "consciousness" was singing to "consciousness" and being witnessed. In other words, the One Squirrel Heart spoke TO me THROUGH me, and LOVE was seen. I guess you could call that a "squirrel awakening"! I want to acknowledge my profound love and appreciation to the late Mr.Nut. He crossed over on my 60th birthday last January. You can hear his amazing wisdom online: www.SatsangWithMrNut.com. *Pranams is a deep bow of respect, usually seen in the East where devotees fall prostrate on the floor in front of their teacher. Yes, she would give me everything I need. Yes, I am given everything I need. It takes you to the very edge... of you. Yes, you are always given everything. No, we can never lose this love .... we are. Yes, I was always everything. There are simply no words to describe the exquisite and overwhelming love that comes through a little squirrel. And if you happen to be blessed with the sweet friendship of one, then you have been truly graced. My little Muffin loved me like no other. He was and is my sweet angel of love. So much so that at one point I had to change his name from "Muffin" to "Muffinheart". But now I will start at the beginning. Muffin was one of three beautiful boys found under the hood of a student's car at St.Ed's University in South Austin. Luckily, their mama chewed the wires so the girl couldn't start her car. Then her dad looked under the hood and discovered the litter of baby squirrels nestled behind the left headlight. The campus police called me to come get them. God Bless Mama Squirrels! So Muffin, Buddins, and Nugget grew up together until Muffin decided he'd rather be in his own space. Muffin was a little different than his brothers. The summer that Buddins and Nugget were released, Muffin had been sleeping with his mouth against his cage and ended up with crooked and overgrown teeth. So his teeth got trimmed by our vet, and his release got delayed. 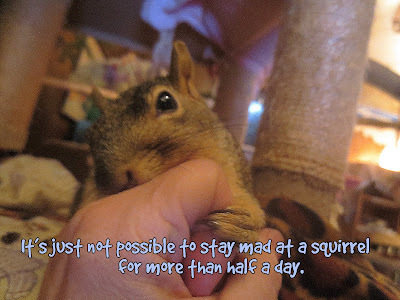 By the time I knew his teeth were fine, it was winter.The main problem with squirrels is that the longer they live with you, the more you fall in love with them. At this point I was head over heels in love with the Muffin man and I dreaded the day I would be putting him in the outdoor cage to get used to the neighborhood sounds and weather. Nevertheless, Spring did arrive and it was Muffin's turn! On the first two tries, he got in fights with other little boys and both times came home with gashes on his little body. The first one was on his back and the second one was across his sweet face. Poor Muffin. I'm not sure if it was harder on him or me! But they say three times is the charm. So I was going to try just once more. Remember, it was also the springtime so mating season was going on. On this third try he had a little fling with Miss Rosie Posie who was also being released. But after several days outside, Muffin came back to the front door and wanted in. And that's the day he officially became an "indoor squirrel". And it wasn't until a couple days before Rosie gave birth in my kitchen that I even knew she had gotten pregnant! and so Muffin got to see his pups grow up. Such a sweet adventure for us all! 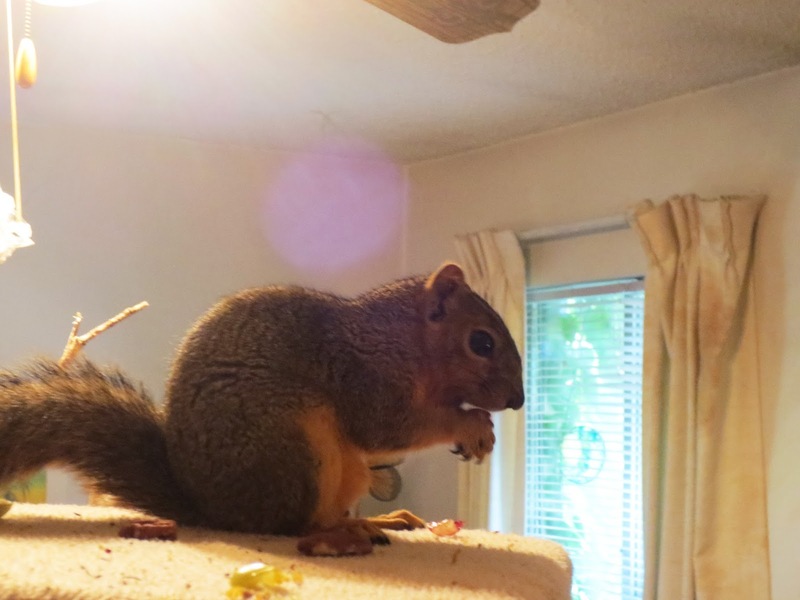 These were such happy times... what could be more fun than a houseful of squirrels? And although the following spring, Rosie Posie and her angels Pookie, Chupie and Rosebud would move outside, the Muffin man remained behind. He loved hanging out in the big cage and giving advice to his young boys when they came home for meals. But the best part for me was sharing my morning coffee time with my Muffinheart. 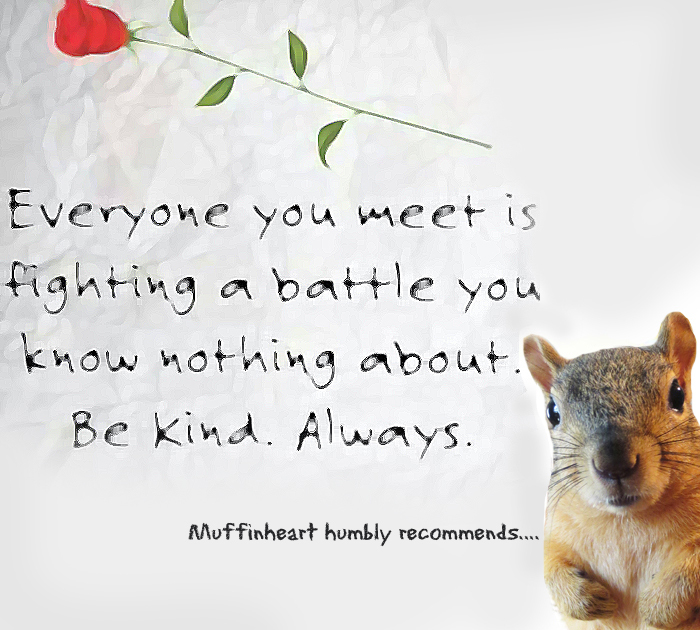 Muffinheart is best know for his affectionate nature. So many videos of him being a loving little buddy and so many photos of his indescribable cuteness! It seemed that every day he would just get cuter and more lovable! So it's especially difficult to say goodbye to such a sweet friend. I still don't know the exact cause, but one day I noticed he was not drinking water from his water bottle on the side of his cage. So I brought the water bowl from his outdoor play-cage and offered him some. He guzzled it down. So I thought the problem was solved. However, he was also not eating much and had stopped pooping. I would offer him his usual food, but he refused. So I tried a piece of rice cake which he loved... but later vomited it up. Not long after, he wasn't keeping the water down either. Finally, I took him to the vet so he could get some SubQ fluids. Dr.Brad gave him 20ml. with a medicine added to calm his tummy so he could keep down food and water. He had lost so much weight, poor fella. Photo of Muffinheart taken two days before he died. was looking off in the distance with a smile on his face. I kept touching him, saying, "Muffin, hey buddy... we're almost home!" We went inside and I laid him on my lap. I loved on him and told him how much I love him. He was so weak and seemed to be only partly in his body. Then he started to move in a circle on my lap... trying to get more comfortable. Then he got still and took two shallow breaths with his mouth open... and I knew he was leaving. and kissed him; his body so so limp. And then he took his last breath. Tears and more tears... oh sweet one. 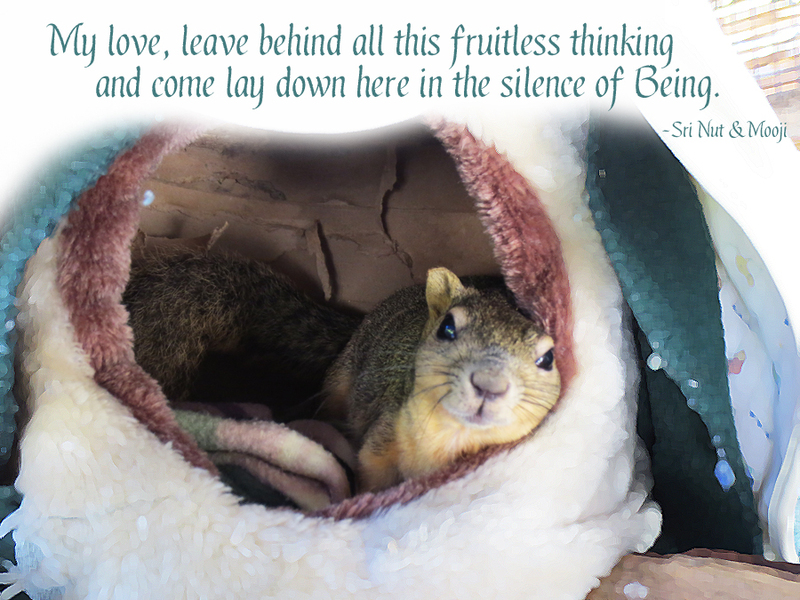 Back when I still thought he would be going to live outside in the trees, I wrote him a love song. And upon listening to it again, I find that it is a most appropriate song for his passing. I call it "Muffin's Song". 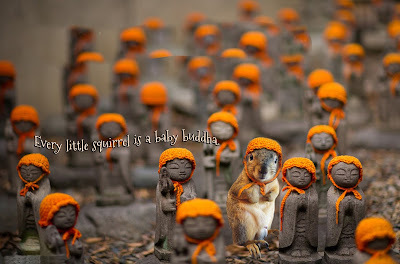 Muffin was indeed a "bodhisattva" squirrel. A being who is so kind and selfless that they come back time and again to teach lovingkindness. And so, his beautiful box of ashes attests to this. to all those who helped make this tribute possible. Capt. 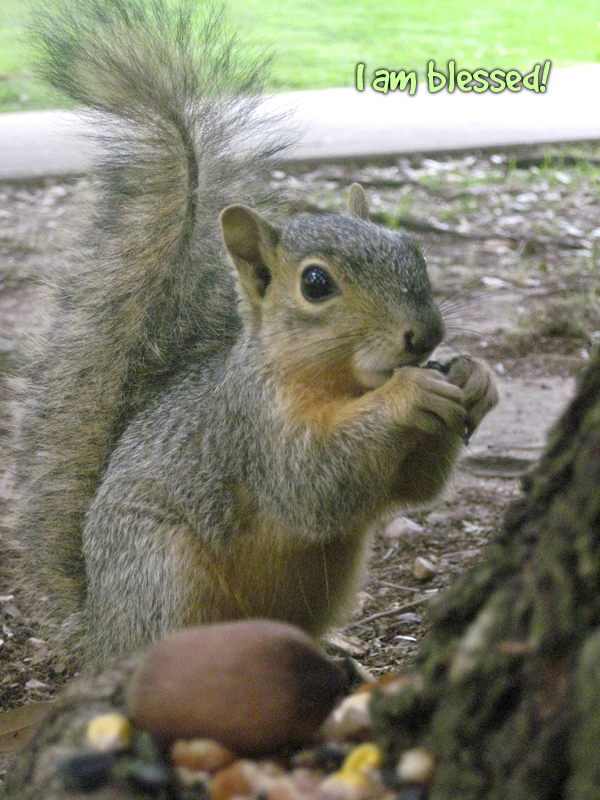 Muffinheart demonstrating squirrel telepathic communication. Have you ever wondered about how little squirrels are able to communicate instantaneously with other squirrels? Unlike our slow Internet, they use the incredibly fast InnerNut. This mode of communication is the fastest and most efficient. It requires no computer hardware and is instantaneous! How is that possible? Because it is direct: heart-to-heart! The InnerNut was popularized and spread over the globe through the ingenious efforts of our late Admiral Nut. He worked tirelessly to make sure that little squirrels and squirrel people world-wide were connected! The connection is simply made via awareness. Once Mr.Nut would telepathically touch your heart, thereafter you became aware of the frequency of compassionate heart-wisdom! The same wisdom that made Mr.Nut the bodhisattva that we all knew and loved, and continue to love! Admiral Nut spent his entire lifetime perfecting the art of effortless communication. He conveyed hundreds of messages of pure wisdom without even uttering a word! 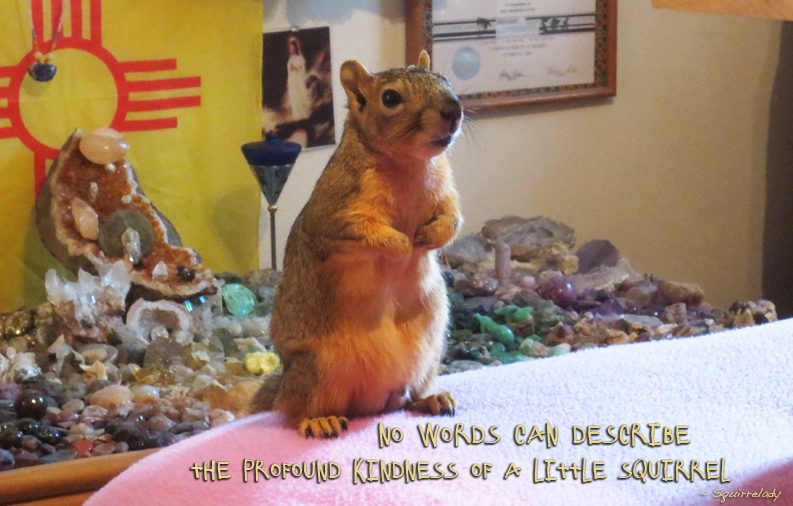 With his pure intent and compassionate heart, he was able to teach the Cosmic principles of Squirrelove to squirrels and squirrel people all over the globe! He has students and friends in every country on this planet and throughout the galaxy! Here is a song in his honor! Thanks to my dear friend Ulf for his lovely music accompaniment and video creation! I was sitting with Capt. Muffinheart this morning and he shared some squirrel wisdom with me. It's that time of the month again when the rent is due and that always brings on stress. The cost of living is going up, but not enough work to cover the basics. So, as I was pondering this dilemma, the thought came (telepathically from Muffin) "Hey you know the prayer is: "Give us this day our daily bread". It's not "Give us this day our yearly supply of bread." Then I realized that my stress was happening from worrying about the future. In this moment, I have a roof over my head and food on the table. The lights are on and I'm not in debt. 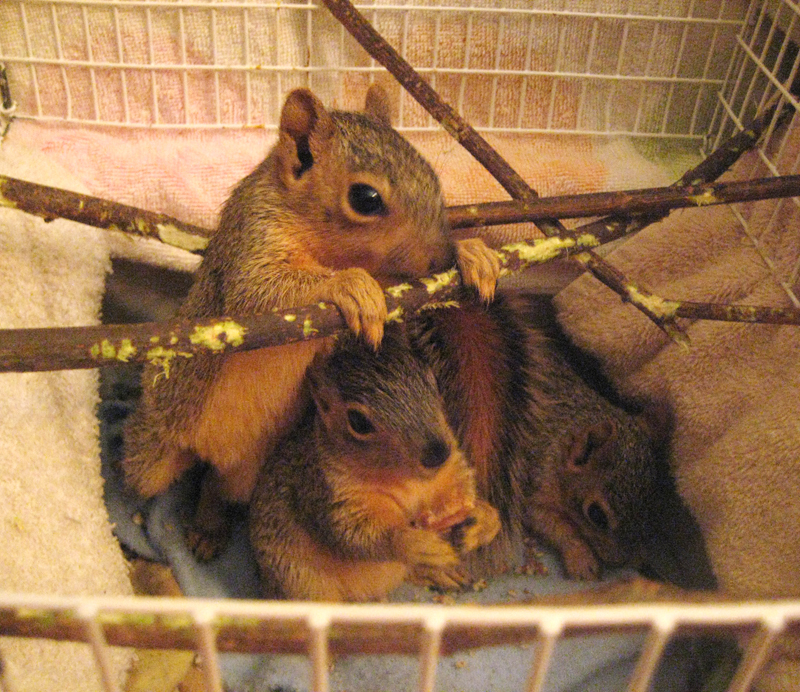 And the squirrels are all healthy and happy! Your Squirrel IS the path to Enlightenment! This morning I was having coffee with my little buddy Muffinheart and suddenly a message came in loud and clear. "Your squirrel IS your path to enlightenment." WOW! Enlightenment is, simply put, the realization that everything is perfect just as it is. Mr.Nut spent a lot of time teaching this wisdom. He was the perfect example of pure Peace and Love. 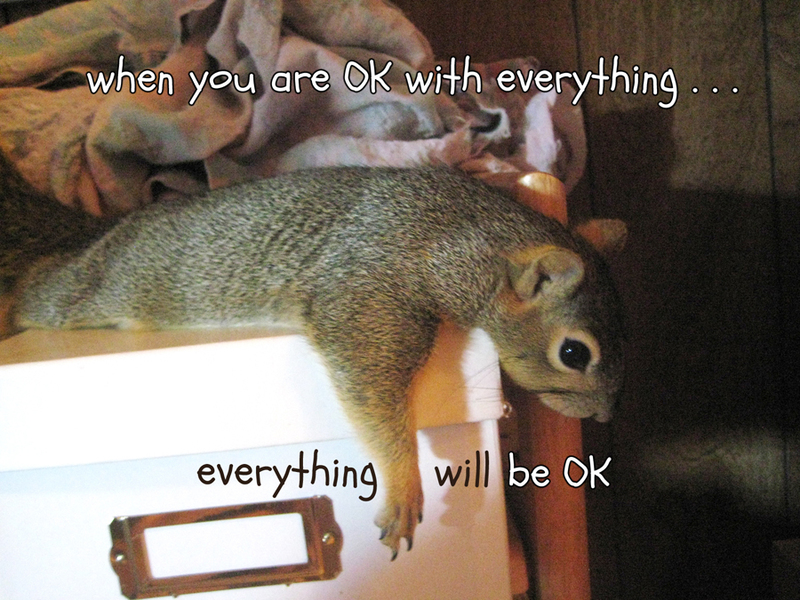 No matter what was happening around him, Mr.Nut always demonstrated pure equanimity. 1. Like Ramana Maharshi, they practice Silence. 2. They accept what is. 3. They always live in the "now". 4. They love you unconditionally. 5. They are always at Peace. 6. They recognize the God in you, even when you don't! And little by little, as we live with our little squirrel buddies, they teach us their calm and meditative lifestyles. You can just observe them in everyday life because they teach by example! Mr.Nut at an early age, teaching LOVE. To learn more about enlightenment, you might want to go to squirrel satsang. Just visit: SatsangWithMrNut.com and immerse yourself in the ultimate Truth! There is nothing more satisfying than the realization of Truth!